Looking to grab the new Blackberry Bold 9900 on an upgrade? Best if you wait till tomorrow as an expected $50 price drop is incoming on October 12th. The upgrade price will drop to $249.99 after a $50 mail-in-rebate and is only good for upgrade eligible pricing with new activations maintaining the $299.99 after rebate price level. It’s a small but necessary price drop for the Bold 9900 which was thought to be well overpriced in the first place. Let’s hope it drops even further. ← Samsung, Google To Announce Galaxy Nexus On October 19th? what’s considered an early upgrade? AKA all those midnight madness sales T-Mobile has. But I like the 7am thing..
It’s pretty laughable that the new Bold is more with a new contract then the new iPhone 4s. Still going to wait til November when it has WiFi. No reason for it not to ship with WiFi. Might wait til the Torch comes available as well. It seems this is the most expensive phone off contract for T-Mobile. I think I got that price. I ordered the phone monday night and they charged me 299. They said I’d be getting a rebate so it should end up being 249+tax and upgrade fee. If not they are going to have to deal with me complaining. You could buy through wirefly, it is cheaper! Yess @ the Samsung Galaxy S II pricing, that’s perfect for me, because I NEED A NEW PHONE, NOW! I’m happy they did away w/ the $50 mail-in-rebate & just made it $229. That’s only on the Value plan, where there aren’t rebates because you pay full price for the device. It’s still $229 after a $50 mail in rebate for Classic plans. I know that. That’s my target market, so that’s what I particularly was looking at. I want the value. 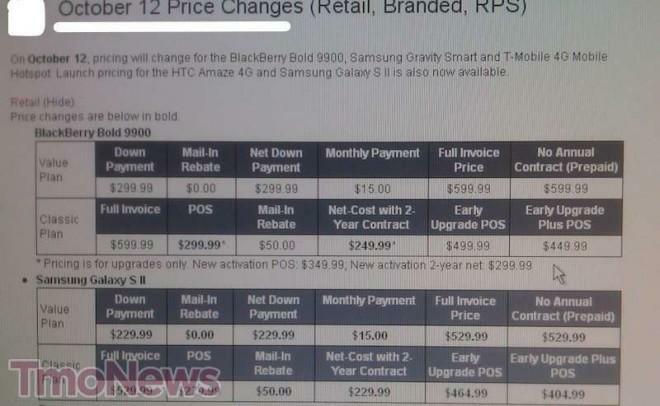 Wow how does BlackBerry/T-Mobile think it is okay to charge more for the Blackberry Bold than a SGS2? Honestly, I was thinking that $99 on contract would be pushing it for the new Bold. Still too expensive. Pass. What’s the price on the HTC Radar 4G? And when will it be availible? see, i believe the SGS2 has the mobile hotspot feature like a lot of other phones, so i’m wondering why there is also a mobile hotspot plan? isn’t this feature free? No it is not free. Is this gimped SGS2 going to get WiFi calling sometime? There never was a way to track it or stop it. Customer care just refuses to troubleshoot it if it doesn’t work until you add the tethering feature to the account. Web service of at least $30/mo AND be eligible for full upgrade pricing. would be nice if it is $229 directly with no nonsense, upgrade shipping and tax. Tmo could pay the tax, all these fees comes to about $100. in the last 2 weeks i have upgraded to the new bold and also new torch! i pay nothing for an upgrade and my line rental is £22.50 ex tax per month. 300 minutes to any network, unlimited text msgs and bbm. Yes i am in the uk and wonder why some of you are paying crazy upgrade prices when i get it for free from the same tmobile company. These companies will rip you off if you allow them too. You should argue a price if its way above your budget.